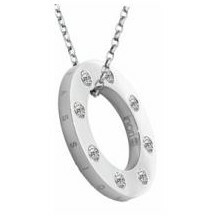 PENDANT beautiful for boy or girl made of steel and ZIRCONS. Chain measures long 50 CM and the PENDANT 28mm GIRTH. Is accompanied by a box, VELVET POUCH, cleaning cloth and CARDBOARD TEABAG.